In a follow-up from the story on Monday regarding the successful launch of the Dragon cargo capsule on the NASA resupply mission, word has been received today that docking with the ISS was successful. The 3 tons of supplies have been delivered safely to the orbiting space station, and the Dragon will remain connected for the whole of April, after which time it will be sent back to earth, again loaded this time with outgoing supplies. Landing will take place in the pacific where SpaceX will retrieve the capsule after it’s second successful mission. At current design tolerances, the Dragon capsules are rated for three missions, so this one may have yet another trip in the future. The goal of re-usability is not only here, but has now been proven to work over and over again, with the results showing clearly in the price to orbit. There is an interesting article over at SpaceNews today regarding the peculiar and sudden imaging restriction imposed by NOAA on SpaceX in the middle of their Falcon 9 launch last Friday. While conflicting reports had been surfacing, including from NOAA themselves, it seems that the truth of the matter has finally begun to surface, and in so doing may be handily managed by the fleet of lawyers. It boils down to restrictions on images of Earth taken from orbit, and a number of bureaucratic hoops one must jump through in order to proceed with that sort of event. What really gets my goat however, is the notion that one government (apparently our own) can claim to exercise rights over imaging of the entire Earth from points in orbit which would only briefly even be over top of the US. It raises in my mind the much larger and more important question of: who “owns” the moon and other planets? Or at least, who claims to? I like to think that Elon and co. can simply get to Mars, set up whatever they like, and then suggest that if someone doesn’t like it they can come there and ask him to stop. The idea that the US (or any nation) would claim to have jurisdiction over the moon or Mars – when so abjectly failing to get us there themselves – is frustrating to say the least. I’m looking forward to seeing that all play out, sooner than we ever expected! Thanks to The Lead South Australia for the most excellent header image. SpaceX has committed to a very aggressive launch schedule for the remainder of 2018, and this back-to-back demonstration of master level rocketry is a direct result! We just finished cheering and celebrating the successful launch on Friday (albeit with shortened video thanks to NOAA involvement) and now we look ahead to the scheduled 4:30pm EDT Monday afternoon launch of a Space Station resupply mission. This will be the 14th mission (code named CRS-14) for SpaceX under the ‘Commercial Resupply Services Contract’ from NASA, and will include about 5,800 pounds of equipment. This is a repeat attempt of a launch which was delayed from February 9th and again from March 13th. Unfortunately the current plan is not to attempt a landing and recovery of this booster, which has flown before and is being reused for this flight – a key feature of Elon Musk’s strategy for reducing the costs of commercial space flight. The rocket will be pushed to the edge of some trajectory limits in order to capture useful mission data, and will be expended upon reentry. Since SpaceX is gearing up to release their new Block 5 version of the Falcon 9, recent (and likely upcoming) missions are cycling out the old Falcon boosters to make way for the new and improved 2018 model. Won’t that be great – when we are versioning rockets as commonly as we do with automobiles? 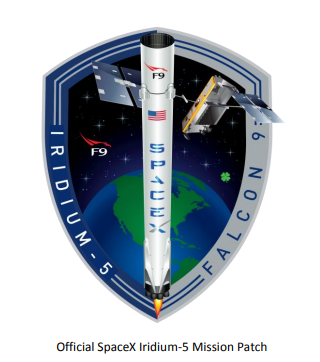 SpaceX Iridium-5 NEXT Mission Today! Get ready for the next Falcon 9 launch, which is scheduled for 7:13am PST on March 30th. The mission is to put in place 10 more satellites for the Iridium NEXT global satellite constellation. Full Mission briefing is available, and should you be able to watch the standard launch festivities here! Author martianjoePosted on March 30, 2018 March 30, 2018 Categories RocketryLeave a comment on SpaceX Iridium-5 NEXT Mission Today! …and plenty more features guaranteed to make this another superstar of a rocket. After months of careful testing, a launch date for the first Block 5 flight has been announced of April 24th. Many things can cause such a window to be adjusted, but that one will go on the calendar and hopefully demo to us all that new and improved platform! Are you interested to learn more about the robot boats (officially ‘Autonomous Spaceport Drone Ships’ or ASDS) that are part of the SpaceX fleet, whose primary mission is to facilitate the recovery of rocket first-stages at sea? Of course you are! So am I! The scope and breadth of what it means for a company to pursue a single minded goal, and to invent from whole-cloth anything they may require to get there is evident in so many aspects of the SpaceX operation. One small corner of that process – which could easily masquerade as an entire industry on its own – are the autonomous drone ships. Delightfully named after craft in the Iain M. Banks Culture series of novels, these ships contain their share of tech which should make other industries blush at the audacity of no-holds-barred, forward thinking innovation. This will be the first of a multi-part series that dives into the known technology behind the drone ships, and today we will start with the engines. Each of the football-field-sized ships (“Just Read the Instructions” stationed at the Port of LA, “Of Course I Still Love You” and the under construction “A Shortfall of Gravitas” based out of Port Canaveral) are driven by four diesel powered azimuth thrusters made by Thrustmaster. These marine propellers are designed to be rotated to any angle, allowing for high precision steering and the elimination of the rudder. 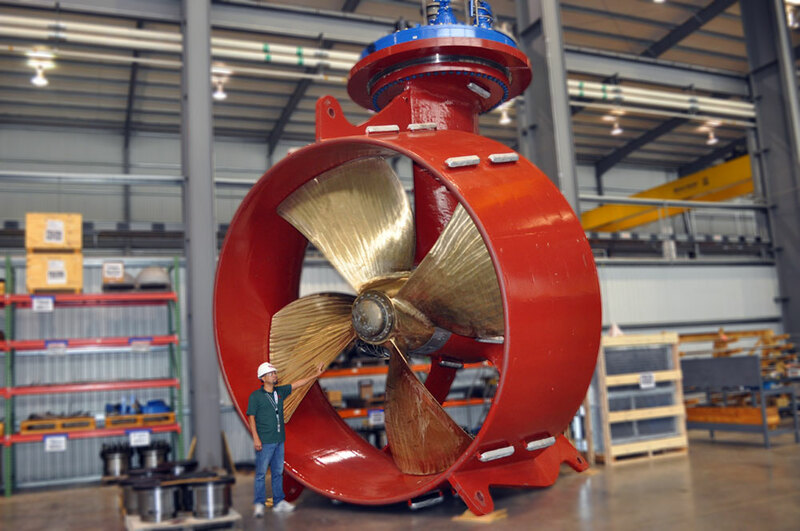 While it isn’t clear yet which model is being used on the ASDS, a likely candidate is the Bottom Mounted L-Drive Azimuthing Thruster, which specializes in absolute positioning capability for offshore supply vessels. Their largest model of this line is the TH10000ML with an 8000 kW motor. Operating at a peak of 720 RPM, this drive is capable of generating 1337 kN of thrust and weighs in at a remarkable 194,006lbs. I like to imagine that there are 4 of these beasts under each recovery platform, and there are suggestions that these main engines are further assisted by additional smaller drive systems, all computer synchronized and coordinated with a proprietary GPS system. The design specification of the SpaceX vessels, which are based on Marmac barge hulls, is that they must be capable of precision positioning within 3 meters even under storm conditions at sea. Imagine, keeping this floating platform stable enough to vertically land a rocket, then keep it steady enough to not simply tip over before it is secured through a combination of robotic and human assistants (the subject of a future article). Take note, SpaceX fans, that the Los Angeles Board of Harbor Commissioners has just approved a plan by SpaceX to lease an 18-acre site at the Port and a 200,000 square-foot space to be used for manufacturing. I think we have our BFR production facility, and things could hardly be more exciting! This space is right next to where everyone’s favorite drone ship, the Of Course I Still Love You, is docked and ready to be mustered into action. Looks like a brand new space-coast is emerging!